Pallet Dolly | Pentek, Inc. 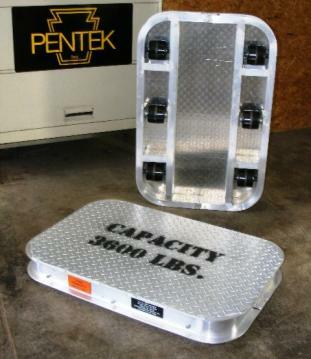 The Pentek VP-090D Pallet Dolly is a lightweight, mobile platform. It is equipped with six (6) tapered rollers positioned with three (3) rollers on each side, aligned to the direction of travel. The Pallet Dolly agile. The design places the two (2) center rollers slightly lower than the end rollers. This creates a central pivot point which allows the dolly to spin around its central axis. The dolly is stable. The 6-roller design provides both balance and strength. The dolly is narrow. The slim 24-inches wide platform comfortably travels down narrow corridors and into tight galleys. The dolly is light. Unloaded, the empty dolly weighs 35 lbs. The dolly is easy to care for. It requires no routine maintenance.